A set of home theatre speakers is where it's at if you want the absolute best sound experience in the comfort of your own home. So forget the speakers that are built into your TV, and forget space-saving soundbars: we bring you the best home theatre speakers on the market. What to consider when buying home theatre speakers? Usually there'll be at least six components of home theatre speakers. You'll have two stereo speakers at the front, a centre speaker between them, two speakers at the rear of your room, and a subwoofer to create bass. Five speakers, plus one subwoofer, equals a 5.1 system. Finally you'll need a home theatre receiver to take the digital signal from your TV or other source and send audio signals to each speaker. But this is a setup that won't suit everyone. If you have a smaller living room then a soundbar would be a far better investment for you. A set of speakers might beat a single soundbar at a premium price point, but as things get cheaper soundbars start to become far better performers. If you're limited on budget then you might be better off with a home cinema system, which bundles together the amplifier along with the speakers into a single unit. You won't have the versatility of being able to choose your own components, but depending on your needs that might not matter. A final option could be to combine the space-saving benefits of a soundbar with a pair of additional speakers to offer a halfway house. Our best surround sound speakers guide contains a number of these options. So read on for our pick of the best home theatre speakers and get ready to enjoy the ultimate cinematic experience from the comfort of you own home. Dali are a brand well known for their exceptional sounding equipment, so it's no surprise that its home theatre speakers are an absolute treat. The Zensor 1 5.1 are a great set of speakers. Available in black, white or walnut, the speakers have received great reviews across the board, and even received a WhatHiFi award for being the best speaker package under £1,000. In the package you're getting four bookshelf speakers in all, plus one centre speaker and a subwoofer. It's a complete package and will make films and TV shows sound absolutely amazing when paired with the right home cinema receiver. It was a tough choice between the ELAC Debut and the Dali Zensor for our top choice, but ultimately the Zensor won out based on convenience. However, if you're after a slightly more flexible surround sound setup, then ELAC's Debut series might be a better option. This is because, in the UK at least, it's impossible to buy the speakers as a 5.1 package. Instead you'll have to buy them separately. 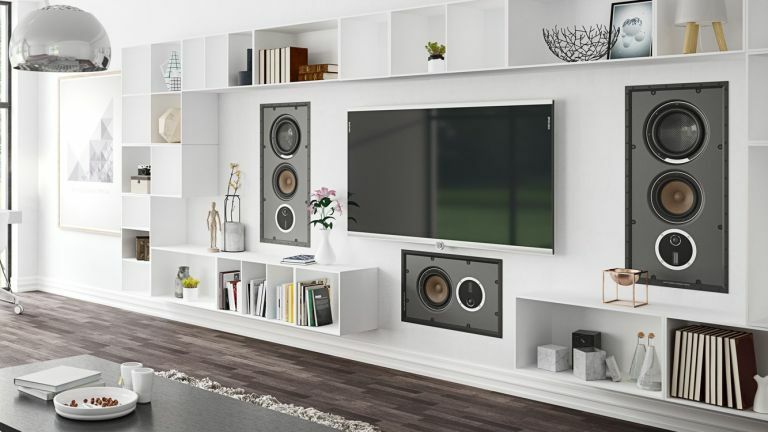 Although this adds a little complexity, it does mean that you'll be able to choose between floorstanding and bookshelf speakers for your front stereo pair, which is enormously helpful if your living room only supports one or the other. This flexibility also means you can add a pair of Atmos-enabling upfiring ELAC Debut A4 speakers into the mix if you so choose. Spend a little more and the returns start to get slightly more marginal, but depending on how much you care about audio quality that might be a cost worth bearing. Monitor Audio are a brand that produce speakers up and down the price spectrum, but what's nice about their cheaper sets is that they tend to benefit from all the high-end tech that the firm develops for their more expensive speakers. The result is that although the Bronze speakers sit further down the brand's range, they sound like they should cost a great deal more thanks to their bags of detail and a tone that's overall very warm and clear. We're also particularly fond of the traditional wood look of the speakers, but this will of course come down to personal preference thanks to the four finishes that are available. If you want to really splash out on a set of home theatre speakers, then Monitor Audio's step up Silver 200 AV12 are a great set. There's very little to complain about here aside from the premium price. These are a set of very capable speakers, which has earned them WhatHifi's award for the best speaker package under £3,000. Spending this much money gets you a truly impressive set of speakers that manage to walk that fine line between delivering powerful sound that's not lacking in detail. Want more expert home tech advice?